Snorkels are an excellent way to protect your 4 wheel drive’s engine. The higher air intake gives you the combined benefits of cooler & cleaner air intake, safer water crossings and increased airflow for improved performance. 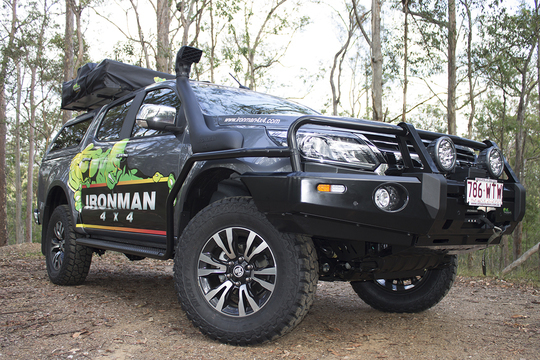 Available for a wide range of vehicles, 4WDs fitted with Ironman 4X4 Snorkels benefit from increased airflow to the engine and a raised air intake to minimse the chances of water intake. These snorkels are manufactured from high quality materials which are UV resistant to increase longevity, plus a built-in rain deflector to stop water getting in during heavy downpours. All built to Australian standards. Designed to fit neatly and snugly to the contours and air box configuration of individual vehicles, with full installation instructions and template included, be sure to check that you are ordering correctly for your vehicle make, model and build date.